Fiduciary …..A note to the SEC from John Kvale of J.K. Financial, Inc. Occasionally the Securities and Exchange (SEC) asks for comments on certain areas of the financial industry. 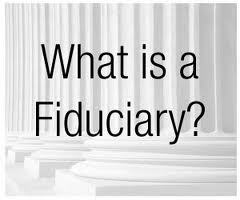 Fiduciary is one of the most lightening rod terms ever used in the industry. It represents liability and a higher level of accountability. Many years ago (20+ now) I found myself working for the company and the client in conflict. That was a deciding point in my career to leave the conflicted world and work as a Fiduciary for the client, and only the client. The capital markets cannot work as we know it if everyone is a Fiduciary. This is fine by us, there are companies that are for profit and that is great. Not being a Fiduciary is not a terrible thing. Our only request is that investors understand the difference. Here is my comments to the SEC as we take our industry and the future of it very seriously. We hope you like your representation through our voice. This morning there is an Op-Ed Article in the NY Times from a 10+ year former employee of a large investment bank that is sure to make for conversation. The main theme of the statement is that this particular employee left the firm because in his view, the firm profits were taking priority over the client’s best interests. With no insights into the accuracy of this person’s statements, I will share with you a defining moment in my career that somewhat rings similar. Very early in my career, well over fifteen years ago, I returned from a client appointment to be chewed out by my manager. In his opinion, I had failed by doing right by the client and not offering/selling the most profitable product for the firm. It was an easy decision at that point to make plans to begin a career outside of such pressures. We, as a Fiduciary for our clients, operate in the best interest of the client in all cases, not the company, not the vendor, only the client. It is a nice place to work and makes our careers much more rewarding. Does this mean we will not make mistakes? Of course not, we will, but we will always have client best interests at heart. Since we work from a glass half full position, we will cut this post short rather than pour gasoline on a negative subject. It is worth noting that not all relationships in our lives have the ability to work in a Fiduciary manner. Keeping track of who is on your side and who is not, is sometimes challenging. We are glad to be here with you, on your side!